The third sports event also casts its shadow: The EMKA Ruhr Cup International 2017. 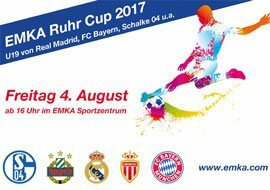 On August 04 the international top Under-19 teams of Real Madrid, AS Monaco and FC Bayern meet at the EMKA Sportcenter in Velbert. World class football presented and supported by EMKA. As a special higlight the world champions in skydiving will be lifted up by the EMKA helicopter right before the last game of the day. After rising up to 4.500 ft the helicopter will airdrop the jumpers to let them descend back to earth to land in the centre circle.